Infographics are getting more and more common when we're talking about MMOs – Revelation Online did it recently and now it's MU Legend's turn. Webzen spilled the details on what you were doing during the first English closed beta, including your favorite class (War Mage), the combined time spent in game (154 years), or how many times players died at the hands of monsters (1,854,710). One more interesting detail concerns the countries where the game was most popular, so you already know that players from those regions will probably make the bulk of MU Legend's second closed beta: United States, Brazil and Poland. You can check the infographic below for more details. 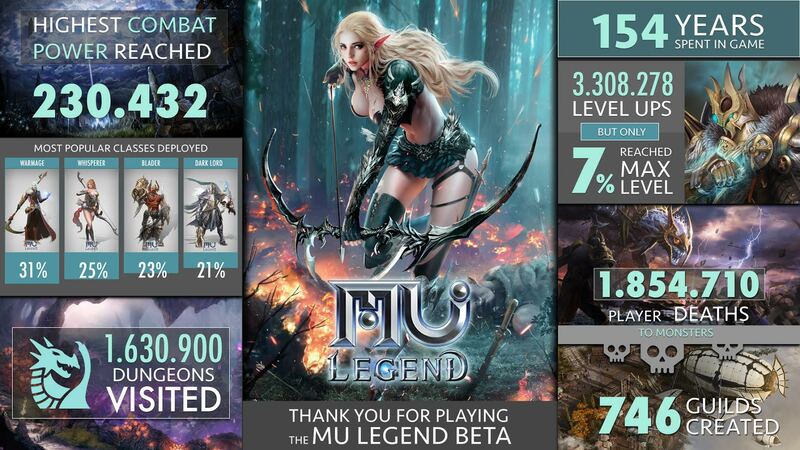 The second MU Legend closed beta is planned for early 2017 and additional language options are being worked on (French, German, Brazilian-Portuguese, Spanish and Polish) so that more players may fully enjoy the game after the two global tests.